Да бъдеш трол е изкуство. Esti trolo estas unu arto. Die Trollerei ist eine Kunst. Das Trollen ist eine Kunst. Le trolling est un art. I accept that. I'll add a quasi-indefinite article, "unu" (which we don't have in Esperanto), as a parallel to that "a". @kebukebu, "esta" could indeed be considered a misspelling, but I believe Nero's suggestion is better, as "esta" WAS Esperanto in one of the preliminary versions of the international language, and was then changed to "estas". At the earlier stage it was written "está", if my memory serves me right. Interesting :) I agree that "unu" as an indefinite article is a more insidious way to elicit correction requests. in Polish language is an error. The sentence should have an error in it, as also the original sentence consists of an error. This is why, I believe, the word has been used in Polish with a wrong case/form (to conform to the mistakes in all the other sentences ;-)). I'd suggest correcting the mistakes, because people might want to use these sentences, but won't expect mistakes in them. However, there already is a set of correct sentences: [#635632]. 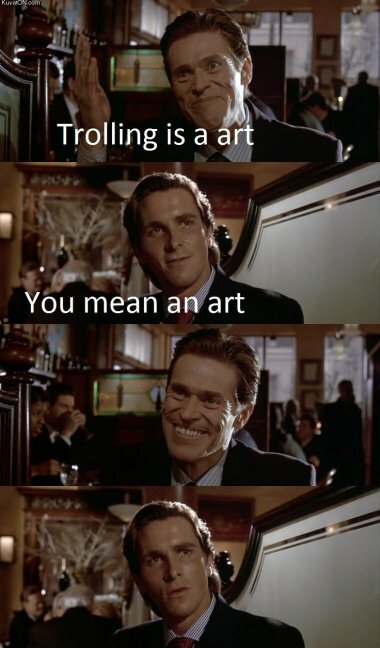 Trolling isn't an art; eats an unart! do we even have a tag for such sentences? "an" yerine "a" diyerek trollemişler. Kötülerinden sakınılmalı yoksa zarar verir.